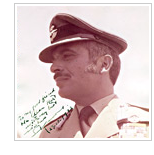 He’s been to war with the Israelis and the Arabs, but the learning experience he values most, and which he believes gave him rare insight, came from his one-to-one private conversations over the years with many leaders on both sides of the conflict. With, for example, Golda Meir, Mother Israel, and Yasser Arafat, Father Palestine. 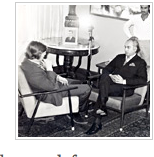 The significance of these private conversations was that they enabled him to be aware of the truth of what leaders really believed and feared as opposed to what they said in public for propaganda and myth-sustaining purposes. 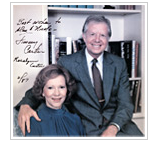 President Carter had been prevented by Prime Minister Begin from involving the PLO in the peace process, an opening made possible because Arafat had signalled, secretly and seriously, that he was ready to make peace with an Israel inside more or less its pre-1967 borders. Carter was in despair and said, in private, that events had once again proved that it was impossible to advance the peace process by institutional diplomacy (because of the pork-barrel nature of American politics and the Zionist lobby’s awesome influence). It was then suggested to Alan that he should undertake an unofficial, covert diplomatic mission to get an exploratory dialogue going between Arafat and Peres, with himself initially the linkman. The assumption at the time was that Peres would win Israel’s next election and deny Begin a second term. The initiative was funded by a small number of wealthy British Jews led by Marcus Sieff (the Chairman of Marks and Spencer) with the approval of Lord Victor Rothschild…. It happened and enough progress was made to get Peres and Arafat into public dialogue in the event of Peres winning the 1981 election. Unfortunately, and against all expectations, he did not. In the course of this mission, Alan learned two things. 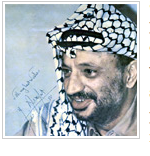 The first was the truth about the miracle of Arafat’s leadership – his success in persuading his side (most of it) to be ready for unthinkable compromise with Israel for peace. 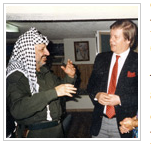 (Which was why Alan wrote his first book Arafat: Terrorist or Peacemaker). The second was why it is difficult to impossible for any Israeli prime minister, even a rational, well-motivated one, to make peace on any terms the Palestinians can accept. A decade later, this initiative became the Oslo process, which might have delivered peace if Prime Minister Rabin had not been assassinated by a gut-Zionist. Alan has long believed that what peacemaking needs above all else is some TRUTH-TELLING, about many things but, especially, the difference between Zionist mythology and real history, and, the difference between Jews and Judaism on the one hand and Zionists and Zionism on the other. (The Zionism of the title and substance of Alan’s latest book is, of course, political Zionism or Jewish nationalism as the creating and sustaining force of the Zionist state, not what could be called the spiritual Zionism of Judaism). Alan is also credited with having played a leading role in getting the ‘North-South’ issue onto the agenda for political and public debate throughout the Western world and beyond. In 1973, frustrated by the mainstream media’s refusal to come to grips with issues that really matter, he set up his own independent production company (World Focus) to research, film, edit and promote the first ever documentary on the full and true dimensions of global poverty and its implications for all. The end product, a two-hour film titled FIVE MINUTES TO MIDNIGHT, had its world premiere, hosted by Secretary General Kurt Waldheim, at the formal opening of the 7th Special session of the UN General Assembly, (called to discuss the need for a New World Economic Order); was screened on television in most countries of the North; was versioned for schools in many countries; and became something of a standard work of reference. (The visual impact of the production was supplemented by statistics then new to the world including, for example, the estimate that, in the South, 15 million children under five were dying each year from a combination of malnutrition and easily preventable diseases – in a word, poverty). To make the project work, Alan, on the strength of his international reputation, raised £1 million in grants from international development institutions and governments and put together a think-tank of world leaders to advise him.